Posted by aquillam in Astronomy, Science, Second Life. Rob Knop does a regular astronomy lecture, about every 2 Saturdays in SL, and yesterday he happened to mention his blog. Herschel and Plank launched safely yesterday. Also, the Hubble Servicing Mission is underway. They successfully changed out WFPC2 for WFPC 3 yesterday, with some really tense moments when a bolt wouldn’t come loose. I’m pretty sure my neighbor was holding his breath for a good 15 minutes while they tried to figure out how to get the bolt out, and there were quite a few small cheers up and down the hall when Drew Feustal broke the torque on it. Astronomers are very excited about WFPC3 because it is a much better camera than WFPC2, and WFPC2 is the one that brought you most of the spectacular images and amazing discoveries like planet forming disks, moons of Pluto, expansion of supernova remnants, and distant galaxies associated with quasars, just to name a bare few. If you want to watch the action, check out NASA TV at http://www.nasa.gov/multimedia/nasatv/index.html. You can also get the latest updates from http://hubblesite.org/. NASA TV is also frequently playing on Explorer Island in SL and a few other locations if you want to try and watch with somebody. Posted by aquillam in education, Second Life. The Wolverine Community has “brown bags” every Friday on Wolverine Island. This semester, we’ll be doing some theme-semester realted tours of astronomy places in SL. Members of the Wolverine community can gather at the telehub before we head to astronomy exhibit on Primrose. Posted by aquillam in Astronomy, Second Life. The exhibits right now are heavily image oriented, so if you have a slow network or computer, you’ll have to have patience. There’s an exhibit based on the IYA Special Project The World at Night: http://www.astronomy2009.org/globalprojects/specialprojects/worldatnight/, and another based on the Cornerstone Project From the Earth to the Universe: http://www.astronomy2009.org/globalprojects/cornerstones/fromearthtotheuniverse/. My favorite though is the exhibit that can’t be done on a website. There’s a sort of igloo-shaped building with a couple different exhibits. 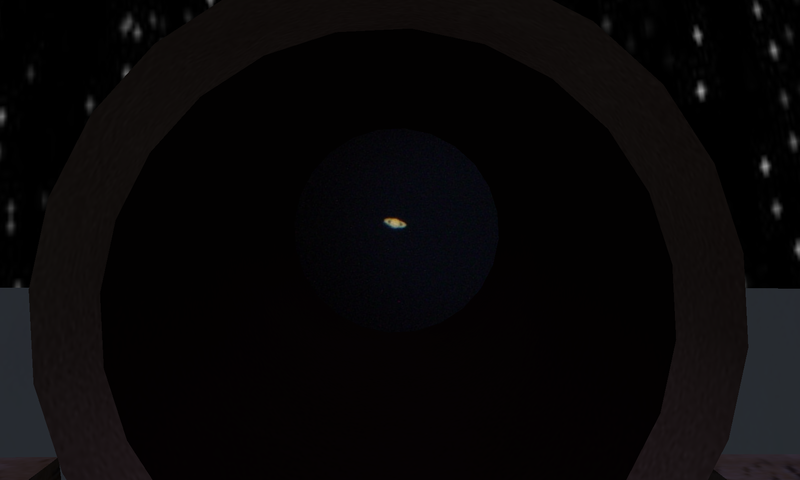 One is Galileo’s courtyard, which has the nicest telescope I’ve seen so far in SL. To use it, rt-click and choose “sit here” (I kept trying to sit on the box or “touch” the telescope. You can see a couple objects like the picture of Saturn here. The images are similar to what they would have looked like to Galileo. The other exhibit is on light pollution, a “night-wise” street. It shows the difference between good and bad lighting. Of course, there’s no blinding glare in SL, so it’s not as bad as a street with that lighting would really be.